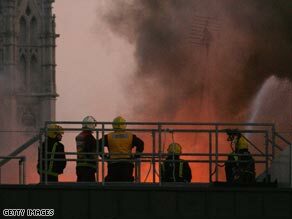 A fire raged for hours in central London Wednesday, sending black smoke high into the air over the city. The fire started in a building under construction and spread to a neighboring building, firefighters said. People have been evacuated from the buildings, police said, and they do not believe anyone is in danger. The fire is just north of the Royal Courts of Justice, and near the Maughan Library of King’s College London, which houses the college’s rare books collection. The library occupies the Victorian former Public Record Office building on Chancery Lane. Neither the library not the courts are on fire.